“It was a dark and stormy night…” This famous quote at the start of British author Lord Lytton’s 1830 novel Paul Clifford was used often by Charles Schultz in his “Peanuts” comic strip, as well as by novelists struggling with “writers block.” But it has never rung so true to me, as I struggle to begin this essay. 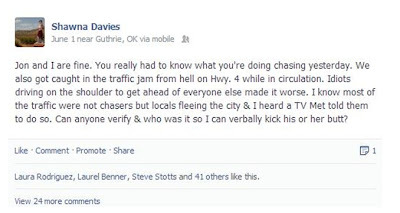 Nearly a month after the deadly May 31st, 2013 tornadoes and flooding in central Oklahoma, I still feel a strong need to write about the near-catastrophe of media communication and public anxiety that day in Oklahoma City. I was there that evening. My husband Jon is a severe weather researcher, and I do severe weather awareness outreach; we are also both storm chasers. Between us, we have over 40 years combined experience with severe weather events, and have seen a great variety of situations. 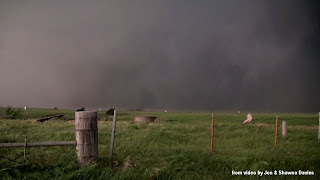 However, even with all our knowledge, experience, and awareness as chasers, what we encountered on the roads that night in Oklahoma City was in a league all its own. Another rain-wrapped circulation (not tornadic, thankfully) passed near us as hundreds of cars crawled slowly southward on Hwy. 4. 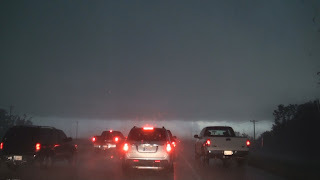 The next hour was quite hair-raising and very frustrating, with what seemed like thousands of people sitting on the open highway as tornado warnings were issued both left and right of us. Fortunately, no strong tornadoes came down upon the city at that time, or simply put, it would have been a massacre. Someone forwarded me a link of a portion of Mike Morgan’s KFOR broadcast from that evening, where I indeed heard him tell people to flee south ahead of the El Reno storm as it approached Oklahoma City. It’s true that a new but weaker tornado did damage near the airport and over southwest parts of the city just north of where we had been stalled in traffic. But after our experience in the traffic jam, I was truly stunned that he had told people to flee their homes in a large metropolitan area! However, my feelings quickly shifted in another direction when we soon learned of the deaths of 3 tornado researcher friends, which took precedence over other issues during the next two weeks. The question of responsibility regarding these flooding deaths during the May 31st, 2013 event has puzzled me. On one hand, Mr. Morgan did a great job during the May 20th Moore tornado, and, apart from telling people to "flee", I feel he did a reasonable overall job on Friday evening May 31st. 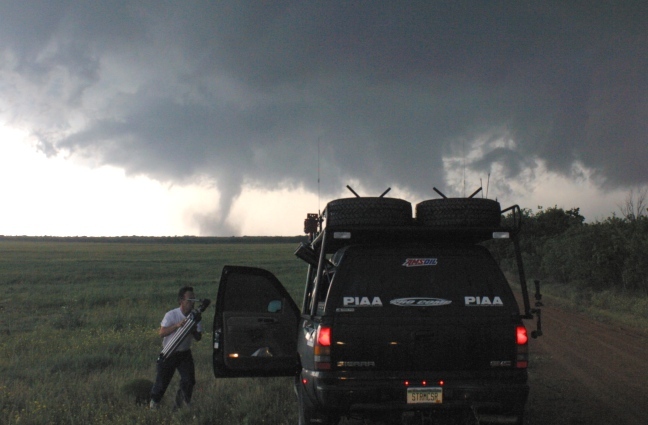 It is true that Morgan has covered many tornadoes over the years, and he is human like us all; he may have been somewhat tired and overwhelmed, particularly given the elevated local anxiety from the recent Moore event. And now another large tornadic storm was approaching Oklahoma City from the west. On the other hand, I do feel strongly that he should not have told people how to take shelter at the last minute, particularly his suggestion that people without underground shelter get in their cars and "go south". Viewers know that on-air meteorologists are there to supply warning information during weather. But it is up to citizens themselves to be aware and know what specific actions to take in advance of potentially dangerous conditions - especially in high risk tornado and / or flooding areas. It is their responsibility to decide on the best shelter BEFORE severe weather strikes. The above article from NewsOK highlights this issue. There was debate in the family about whether they should seek shelter inside the apartment complex, or leave and head to the storm culvert at the last minute. As a severe weather preparedness and awareness advocate, I find this incredibly sad and frustrating. Regarding weather, I have observed over the years that most citizens only want to know, “Will it rain at my wedding or picnic?” Or, “How hot or cold will it be so I know how to dress today?” When people do pay attention to severe weather events, they do so because: A) They have had ‘close calls’ in the past that frightened them enough to pay attention, or B) they are weather enthusiasts who have a natural interest. Most others have what sociologists call “optimism bias” or an “it-can’t-happen-to- me” attitude, so they do not pay attention until it is staring them in the face. Therefore, it is no surprise to me that people took Mr. Morgan’s word and did as he said… flee! Do I think Mr. Morgan or KFOR is liable? I have no idea; I am not an attorney. However, (and with all due respect to the deceased), he never did say “go into a storm drain or culvert”. But, again, he should take responsibility for telling citizens to “flee”, and perhaps apologize, explaining the situation for the sake of public trust and future lessons that can be learned. 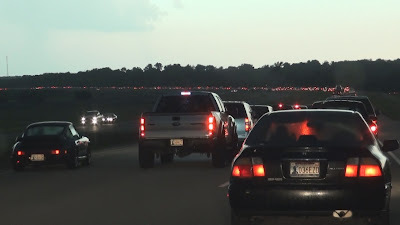 Clearly, suggesting that people near or in a large city flee a tornado in their cars can result in massive traffic jams and a deadly recipe for disaster. What can we learn from this deadly event? 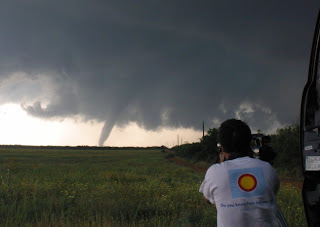 · FOR THE PUBLIC: As many friends and colleagues in the weather community know, when it comes to educating the public about taking responsibility and learning basic tips to increase chances of surviving severe weather, especially tornadoes, we still have a long way to go. A famous quote says, “You can lead a horse to water, but you can’t make him drink”. Very true, but we must still continue to lead, for at least some people will drink. We also need to continue to push for the public to invest in safe rooms or underground shelters in tornado prone areas – such as the Oklahoma City and Moore – as well as investing in phone apps and weather radios to stay well informed. The same goes for state and local governments regarding public places such as schools, outdoor facilities and so on. Lastly, we also must also continue to preach about staying informed ahead of time, so that citizens are not caught on the road; DO NOT take cover under overpasses or in flood-prone areas. On May 31st, I saw cars packed in on both west and east lanes under an overpass, even parked all the way up close to the girders (I’m amazed some didn’t roll down embankments!). · FOR THE MEDIA: On-air people must be very careful about their wording of warnings. It’s their responsibility to properly warn as fast and direct as possible to give people time in the path of tornadoes to find adequate shelter. But citizens must use their own common sense to decide what is “appropriate shelter” for each living circumstance – you can’t make that decision for them! From available information, as of this date, 20 people perished (with one child still missing) on that evening from tornadoes or flooding, and two additional people died from flooding the next day. My hope in writing this essay is to emphasize that one casualty is too many, and we all must learn and spread the word from this event to prevent other tragedies. I hope that we continue to improve our already excellent severe weather watches and warnings, and that all involved with storm chasing and meteorology will seriously continue to teach and educate citizens concerning responsibility during severe weather events. NWS released new information on Friday's tornado near El Reno OK, rating it EF5, and showing it to be a record width (2.6 miles). The map above shows the updated path, and the damage track from satellite (inset). With the death toll now reaching 19 people, it was truly a dark and tragic day. I've been trying to make sense of what happened, and today's information along with a careful analysis of radar data offers some clues. 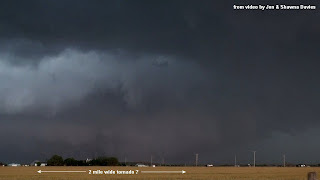 The mesocyclone and tornado appeared to be "arcing" around a pivot point within the larger storm cell, and as it curved northeastward, it accelerated significantly. As some chasers have pointed out online, a simple analysis from conventional radar data of the movement of the storm-relative velocity couplet shows that the tornado, along with getting wider and more intense, increased it's forward speed from 20-25 mph to over 40 mph for a time (see speed annotations on the map above). This unanticipated movement may help explain why so many storm chasers were caught suddenly in the path, including the tragedy of Tim Samaras and his crew (see my prior post). This next image shows how hard it was to see the tornado at times, wrapped in rain curtains and poor contrast when it was about a mile to our west. This was truly frightening, and we high-tailed it to the south well out of its way. I hope this tornado case forcibly reminds us that many tornadoes aren't always visible, and that they don't always move and behave the way we expect them to, even for the experts. Friday was a sad, scary day. When I get time down the line, I'll try to post some more analysis about this case. My blog has been on hiatus due to family stuff and selling a house over the past year. The last post I made was about Tim's lightning research article in Nat Geo magazine this past August. Now sorrowfully, this. I don't know the exact circumstances, but the roads were very crowded on Friday. 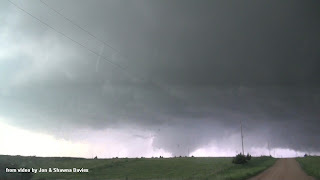 As Shawna and I watched the rain-wrapped tornado to our north, changing direction from southeast to northeast near El Reno and highways 81 and I-40, we were quiet. At one point earlier, Shawna had even said, "I'm afraid some chasers are going to die today." I would never have believed it would be Tim and Carl and Paul. I can only imagine that they got caught in the chaser and local congestion as the hard-to-see tornado suddenly moved leftward. Tim and Carl were gentlemen, very considerate/ compassionate people, always balancing chasing safety and setting a good example with their up-close research work. They would have let others get out of the way on a crowded road before themselves, unlike some other "me first" people I saw driving on Friday. There's something of a tendency to over-eulogize people when they pass on, but Tim and Carl were truly first and foremost a class act, willing to talk to anyone, not caught up in any storm chaser "celebrity". I always looked forward to seeing Tim and Carl. And Paul was just coming into his own with humor and a passion for learning about storms, like his dad. It goes without saying that Tim was a pioneering scientist and engineer, a ground-breaker, incredibly creative and cutting-edge. I will always have the greatest respect for him. One of the great experiences of my life was a 10-day period in June 2005 accompanying Tim and Carl on one of their expeditions funded by Nat Geo. We drove from Kansas to the Dakotas and back to Kansas and down to Texas, and then to Iowa, seeing so many tornadoes I lost count. We came close on a couple probe hits, but what stays with me is Tim's boundless energy and focus and enthusiasm. He and Carl were on another level than me, and they greatly inspired me in my empirical forecasting work. I was extremely honored that they asked me to go with them. My hope is that Tim's and Carl's and Paul's deaths with serve as a permanent reminder that storm chasing is serious serious business, and not the "fun/exciting" competitive game for notoriety that so many want to make it. If smart, knowledgeable, dynamic scientists of Tim and Carl and Paul's character met their final encounter, it should make us pause. Mother Nature is dangerous and unpredictable, and that should jolt us back to a huge respect for the forces of the atmosphere. It should also motivate us to continue emphasizing severe weather safety and great research, Tim's true distinction and legacy. 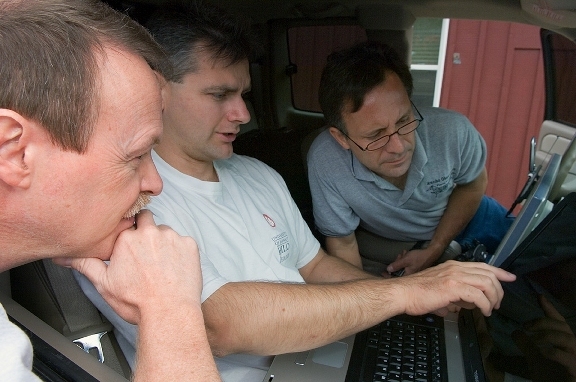 Tim and Carl and Paul have left an enduring mark on severe weather science forever, both professionally and personally. I will miss them more than words can say.